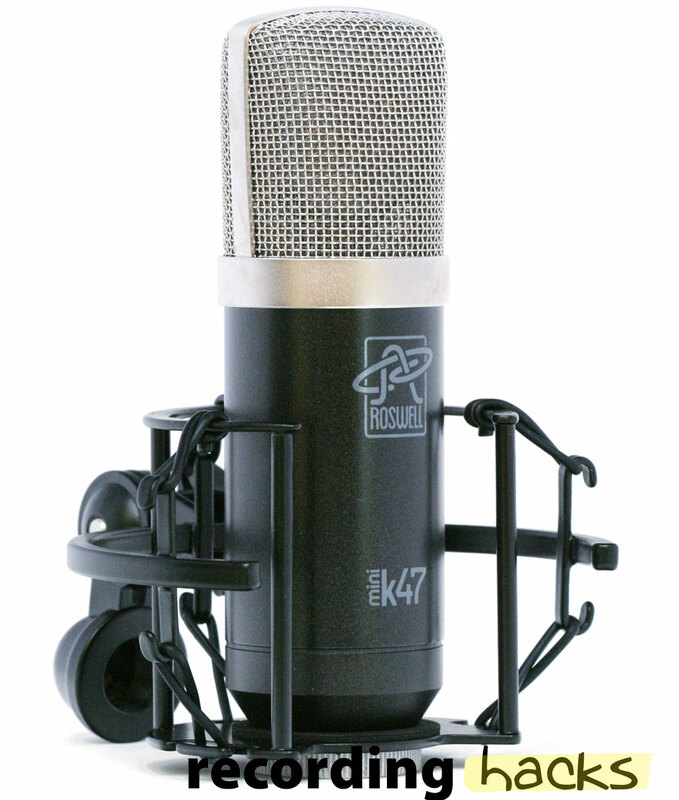 The Mini K47 is a large-diaphragm condenser microphone that is unique for the capsule it employs. 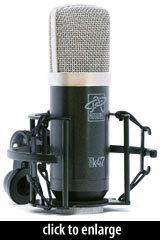 As the microphone’s name states, the capsule is a 34mm K47 style, based on Neumann’s design. It is a true single-backplate capsule, with the characteristic K47 drilling pattern. The diaphragms are made of imported Mylar metallized with gold. The mic uses a linear, transformerless circuit based on the Schoeps design. It delivers relatively high sensitivity (18mV/Pa) and low self-noise (13dBA). The input coupling capacitor is an upgraded polystyrene type. The JFET is a selected low-capacitance K30A type, rather than the 2SK170 (high capacitance) model found in most condenser microphones. According to Roswell, the lower-capacitance JFET delivers superior performance within this circuit. Each JFET is manually biased at the factory to deliver maximum gain without distortion. The main signal capacitors are Wima polypropylene film types, imported from Germany. The microphone’s DC circuit has been modified to improve the signal-to-noise ratio. The body sleeve is made of heavy steel. 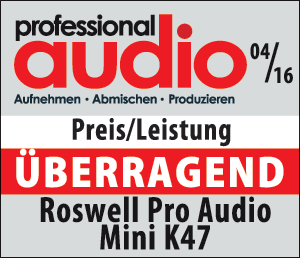 Each Mini K47 goes through a 7-point test/QC program, including a 24-hour burn-in, an acoustic frequency sweep, and tests for polarity, sensitivity, and noise. A serial numbered, signed QC card is included with each microphone. The microphone’s headroom was improved by several dB, to make it easier to use the mic on moderate to high SPL sources. The steel mic body is powdercoated, rather than painted. The powdercoat finish is more durable. The shockmount was upgraded to the Cutaway™ mount from the higher-priced Delphos microphone. The mic began shipping in an aluminum flight case. The swivel mount is no longer included, but an upgraded, heavier-duty swivel mount is sold separately. Despite the upgrades, the mic’s price has not changed: USD $299. The company also offers matched pairs of this mic; the match criteria is 0.3dB in sensitivity (measured at 1kHz), and 1.5dB in frequency response (50–15,000Hz).